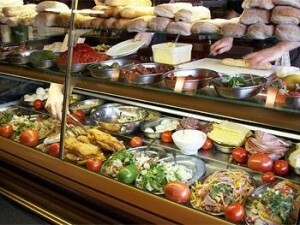 Deli and prepared foods can make a busy life just a bit simpler come mealtime. To fully enjoy your takeout meals, follow the steps on this page to ensure your food is safe to eat. Keep HOT foods HOT – Keep hot cooked foods between 140°F and 165°F until serving time. Harmful bacteria can grow rapidly below 140°F.When food is cooked to temperatures of 165°F to 212°F, most food-poisoning bacteria is killed. The higher the heat, the less time it takes to kill bacteria. Keep COLD foods COLD – Cold food should be held at 40°F or colder. Harmful bacteria can multiply quickly above 40°F. Cold temperatures keep most harmful bacteria from growing and multiplying. Follow the 2-Hour Rule – The absolute maximum time for leaving prepared foods at room temperature is 2 hours—including time for preparation, serving and eating. Discard any perishable foods left at room temperature longer than 2 hours. If you are eating outdoors at a picnic or barbecue on a hot day, discard foods after 1 hour. If not eating immediately, keep your food hot, not warm. Set the oven temperature high enough to keep the food between 140°F and 165°F (use a meat thermometer to check). Make sure all of the food stays hot, including side dishes. Cover with foil to keep foods from drying out. To keep your food tasting good, don’t hold hot foods for longer than two hours before serving. To serve hot foods later, divide into small portions, place in shallow containers, and refrigerate or freeze. Remove stuffing from whole cooked poultry and refrigerate separately. Buy cold prepared foods at the end of your shopping trip so they do not warm up in your cart. Take them directly home and refrigerate or freeze immediately. Deli meats, also known as “cold cuts,” need to remain cold as well. Most refrigerated deli meats are safe to eat for 3 to 5 days; more sensitive cuts like turkey, chicken breast, and rare roast beef may be good for only 2 to 4 days. Buy an appropriate amount to be consumed within these time frames or freeze the extras. If left out of refrigeration for more than two hours, deli meats should be discarded. Whether you purchased your prepared foods hot or cold, you need to take care in heating up your meal. Using an oven, microwave, or stovetop, heat foods thoroughly to 165°F, until hot and steaming. Bring gravy to a rolling boil. If heating in a microwave oven, cover food and rotate the dish so it heats evenly. Inadequate heating in the microwave can contribute to illnesses. Consult your microwave owner’s manual for complete instructions. Serving foods buffet-style can help make entertaining a number of guests more enjoyable for the host. Just make sure to keep hot foods hot and cold foods cold. Keep hot foods at 140°F or warmer by using chafing dishes, slow cookers, and warming trays. Keep cold foods at 40°F or colder by nesting dishes in bowls of ice. You may also use small serving trays and replace them often. Make sure there are plenty of serving utensils to help your guests serve themselves without mixing foods from different dishes. While it is admirable to not waste good food, be careful to avoid food-borne illness in the process. When in doubt, throw it out.